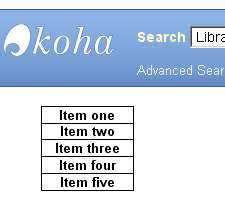 On of the options we have for customizing Koha’s OPAC is to add a custom menu to the left-hand column. Just like with the opacheader preference, this is done by adding HTML markup to a system preference: OpacNav (Koha has an annoying lack of consistency when it comes to system preference capitalization). If you’ve just installed Koha for the first time there is probably some default text in your OpacNav preference, “Important links here.” This bit of example content might lead to questions like “Important links where?,” but it’s just a way to point out one of your customization options. If you delete the contents of OpacNav, the left-hand column will go away on most pages. The exception is the facets column on the search results page and menus on user pages when you’re logged in. The Athens County Public Libraries OPAC has no OpacNav content for a couple of reasons: First, our site-wide navigation is in the horizontal menu in the OPAC header; Second, having a resident left-hand sidebar takes up valuable screen real estate. I’d rather be able to give plenty of room for the content the user is looking for. 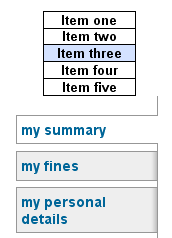 Other libraries choose to add content to the OpacNav preference because it fits their users’ expectations (as it did ours in our previous designs). Luckily OpacNav is just as flexible as opacheader in terms of creating the look and feel you want. Easily done. The next thing you have to consider, though, is how your custom menu is going to interact with the other menu users will see when they’re logged in and looking at their account pages. The user menu is the menu you’ll see on some pages if you’re logged in. 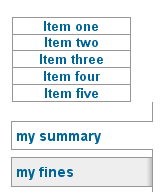 The menu links you to your account summary page (your checkouts, overdues, and holds), your fines, user tags, etc. The user menu, when it appears, will appear underneath the menu you added to OpacNav. After you’ve added a custom menu, log in to your OPAC and see how it looks on the user pages. That’s the basics. Browse through the Listamatic site for more ideas. And remember, you’re not limited to just navigation links when you’re customizing OpacNav. You can add any kind of static content. The Rockingham Free Public Library lists their hours. The Polytechnic Institute of NYU’s Bern Dibner Library has a Meebo widget for instant chatting between OPAC user and library staff [edit: At least they used to. 7-15-2010]. It’s a narrow canvas, but it’s open for just about anything you can think of. This entry was posted in Koha, Koha Customizations, Koha UI and tagged Customization, Koha, OPAC, UI on April 2, 2009 by oleonard. in which file do you put the code? It doesn’t go in a file, it goes in the OpacNav system preference.